LAGOS—BARELY a week after President Muhammadu Buhari cleared the air over his identity, Nobel laureate, Prof. Wole Soyinka, yesterday, raised the alarm over his stolen identity being used on facebook by a Nigerian living in Poland. The Nobel laureate spoke at the 70th anniversary of Human Rights and worldwide reading for freedom of the press in memory of Jamal Khashoggi at the Freedom Park in Lagos. 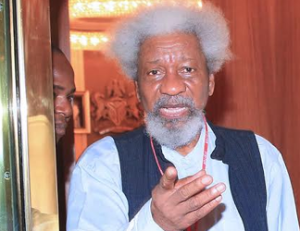 Soyinka, who lamented that he was presently a victim of stolen identity, stressed that the case of stolen identity must not be treated as fake news, saying, this is beyond fake news. His words: “Recently, we have a situation in Nigeria and that is the issue of cloning President Muhammadu Buhari. We have people who have taken that issue seriously. These were people that one can never believe to accept such considering their level of intelligence. The Nobel laureate hinted that his discovery of Poland as the location of his stolen identity prompted him to visit the country and demanded that the businesses operated online including face book, with his identity be pulled down. He said: “But he (operator of the business) refused, claiming that he has authority to do that. In my name, this fellow sells and buys things which I don’t even use. “If the doctrine of freedom of expression was to be reversed, there will be certainly a number of issues to be addressed because expression on social media has taken a quantum leave in the last few years that cannot be imagined.